At Outskirts Press, Inc., we take great pride in celebrating the work of our successful self-publishing authors, and we do so each week through our Self-Publishing Author Spotlight. 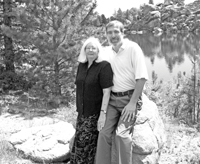 This week we highlight self-publishing authors Tom and Judy Viola (TJ Viola), who has published three successful titles with Outskirts Press. Learn more about the Violas and their published works through this week’s Self-Publishing Author Spotlight. Tom and Judy Viola were both raised on Staten Island, New York. Tom is a retired engineer with an interest in the Roaring Twenties and its impact on American culture. Judy is a retired middle school science teacher and registered nurse with an interest in history, science, and the power of language. Since completing The Gumshoe Chronicles, the Violas are currently working on a new science fiction project. In New York City during Prohibition, only gutter rules apply. New York City, 1920. “I’ve killed more people in the last year than I did in the entire war,” says newly minted private eye Joey Batista. No wonder the DA is after him. But so are Chicago mobsters, a New York drug lord, a corrupt politician, a viperous hit man and even his old gang. Not even Joey’s tight Italian family can keep him out of trouble. In fact, they’ve got secrets of their own. It helps to have a friend on the police force and the respect of the local mob boss. And it doesn’t hurt to have two gorgeous assistants who keep their wits sharp, their knives close and their beds warm. But only Joey can solve the one case that truly haunts him — the mysterious deaths of several young girls at the hands of a serial killer, the same thug who might have murdered the only woman Joey ever loved. In New York City during Prohibition, only gutter rules apply. And Joey learns if you’re gonna survive, you gotta call up your demons, and just hope they don’t destroy you. In 1920s New York, the streets hold no secrets—if you’ve got the right connections. New York City, 1921. “Get too close to the Mafia and you’ll be nothing more than a puppet with the Syndicate pulling the strings.” It’s not the first time Joey Batista, private eye, has heard this warning, but this time he’s honor-bound by his family’s ties to Castellano, the neighborhood mob boss. When Castellano brings in Joey to solve a local waterfront murder, then sends him to Detroit to help settle a Mafia power struggle, Joey realizes his hopes of building a nice, quiet PI business with his gorgeous partner, Jackie, are dashed. If that weren’t enough, he’s also being pursued by a killer with a blood vendetta, an unscrupulous DA, and a pair of notorious hit men. When Castellano’s family is threatened, Joey is drawn deeper into the inner workings of the underworld, pitting him against a foe so deadly that even Joey’s wartime skills as an assassin might not save him. As the neighborhood braces for a Mafia standoff, Joey must decide once and for all where he stands. In 1920s New York, sometimes enemies make surprising bedfellows. New York City, 1922. “I can’t protect the neighborhood forever,” says private eye, Joey Batista, but what choice does he have? With Prohibition in full swing, the rules are changing, and Mafia bosses, like Big Ben Napoli, will sacrifice anything to claim their place in the new order. When Castellano steps down and appoints his ruthless son as the new godfather, Joey finds himself once again in the middle of a Mafia power struggle. To restore balance, he seeks assistance from two unlikely allies, former members of his WWI elite fighting troop who have ties to the growing Communist Party. When Joey’s best friend, Sergeant Mike O’Reilly, is arrested for a crime he didn’t commit, Joey’s long-standing feud with the corrupt DA comes to a head, just as the streets of his neighborhood turn into a battleground. But how can Joey keep the peace without sacrificing what matters most – his family and the love of the only woman who has stood with him through it all? Previous Previous post: Errors-B-Gone: How Can I Clear My Manuscript of Mistakes?